President-elect Barack Obama said Tuesday the deficit appears on track to hit $1 trillion soon. Speaking to reporters after meeting with top economic aides, Mr. Obama said: "Potentially we've got trillion-dollar deficits for years to come, even with the economic recovery that we are working on." Actually, the deficit is on track to hit $1.2 trillion this year, but what's $200 billion among friends? Unfortunately, our puny human brains aren't particularly up to the task. Go back thousands of years and think about the simpler times of human existence. "We had a few friends; we had to be scared of a few animals. A trillion didn't come up very often," says Temple University mathematician John Allen Paulos, whose book Innumeracy addresses the topic. "There is a sense that when numbers are too big or too small, the brain just shuts off," says Colin Camerer, a professor of behavioral economics at the California Institute of Technology. "People either don't think about it at all or there is fear, an exaggerated reaction." The genius of our numbering system is that we can signify massive quantities in short spaces. One billion takes no longer to write than one million does, points out Andrew Dilnot, an economist at Oxford University and author of The Numbers Game. But that similarity trips us up when it comes time to imagine how those figures translate to the real world, where three more zeros make all the difference. "My favorite way to think of it is in terms of seconds," says David Schwartz, a children's book author whose How Much Is a Million? tries to wrap young minds around the concept. "One million seconds comes out to be about 11½ days. A billion seconds is 32 years. And a trillion seconds is 32,000 years. I like to say that I have a pretty good idea what I'll be doing a million seconds from now, no idea what I'll be doing a billion seconds from now, and an excellent idea of what I'll be doing a trillion seconds from now." A common strategy for beginning to understand big numbers is to devise visual representations. One time, sitting at a baseball game in Philadelphia, Paulos started counting seats along the first-base line. Multiplying the number of seats in a row by the number of rows, Paulos came up with a section of the stadium that he figured contained about 10,000 seats  an image he can now think back to whenever a person starts talking about tens of thousands of a particular thing. When numbers get too large, though, that method breaks down. A stack of one trillion $1 bills would reach more than a quarter of the way to the moon  replacing one incomprehensible thought with another doesn't do much good. We next move on to more formal manipulations. 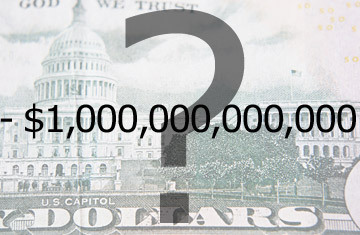 When trying to comprehend a trillion-dollar deficit, you might calculate how much money that represents per person in the U.S. One trillion dollars divided by 300 million Americans comes out to $3,333. Then you search for a useful comparison. A convenient  though perhaps unsettling  comparison is to the amount of credit-card debt carried by the average person in this country. That figure is $3,245. "So a good way of thinking about government debt financing is that it's similar to what the average person is doing," says Camerer. In The Numbers Game, Dilnot and his co-author, journalist Michael Blastland, suggest dividing government spending by the number of citizens and the number of weeks in a year. A $700 billion bailout thereby translates into $45 per week for each American man, woman and child. Going one step further, it comes out to $6 a day. Are you willing to pay $6 a day to have a functioning financial system? Just be careful once you start dividing and dividing again. It's often easy to come up with big denominators that make sense, though ultimately too much dividing reduces numbers to another sort of uselessness. Six dollars a day is also 25 cents an hour, or less than half a penny a minute. Would you be willing to pay less than half a penny a minute? In a society where people routinely don't stop to pick up a penny off the ground, the better question might be: Is there anything you wouldn't be willing to pay half a penny for? See pictures of the stock-market crash of 1929.